In 2014 UConn became a Consortium member of the prestigious Folger Institute, a center for advanced study and collections-focused research in the humanities. Through its multi-disciplinary cross-cultural programs and residential research fellowships, the Folger Institute gathers knowledge communities and establishes fresh research and teaching agendas for early modern humanities. This area of study spans from the 14th through the 18th centuries, focusing on a wide range of relevant texts, issues, and questions. The Institute fosters targeted investigations of the world-class Folger collection and is based out of the Folger Shakespeare Library. The Consortium acts as an advisory body to the Institute, with members meeting bi-annually in D.C. to work with Folger staff on program development and scholarly outreach, among other things. By virtue of UConn's membership, our students, staff, and faculty have access to the Institute’s tremendous range of research, educational and artistic offerings. Check out the “Ruff Draughts” blog for some faculty and staff reflections on time spent at the Folger. Humility in Politics forum at the Folger Shakespeare Theater in Washington, D.C.
Michael Lynch, director of UConn's Humanities Institute, facilitates the panel discussion with Krista Tippet of NPR and David Brooks of the New York Times. UConn's Humanities Institute runs our Consortium membership with the Folger with an interdisciplinary approach. Students and faculty from across our departments and schools—including but not limited to History, English, LCL and the Fine Arts—have attended programs and taken funded research trips to the Folger. UCHI uses its Consortium membership to strengthen the UConn's intellectual community through the “Early Modern Studies” program series, which focuses on scholarly exchange, skills development, and professionalization. The “Early Modern Cultural Encounters” reading group explores ideas on a global scale and introduces participants to scholarship that frequently lies well outside their area of specialty. The “Transcribathon” is an ongoing paleography workshop that not only hones research skills but also will produce, through association with the Folgers’ “Early Modern Manuscripts Online” project, an edition of a previously unpublished manuscript from the Library’s collections. And a running lecture series—consisting of invited outside speakers and works-in-progress presentations by UConn scholars—connects our students and faculty with a diverse range of practitioners in the field. UConn’s Consortium membership and its “Early Modern Studies” initiative provide a range of opportunities for students, staff, and faculty; all are encouraged to take part regardless of school or department. Our UConn community members may take advantage of Folger opportunities by applying for their fellowships and scholarly programs, which include workshops of varying lengths held in D.C. Faculty and staff reflect on time spent at the Folger Institute. 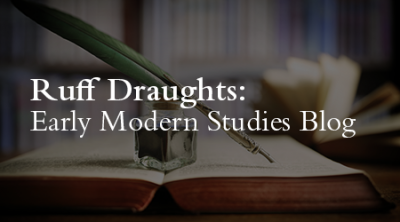 If you are interested in submitting a post to Ruff Draughts or wish to contact the Early Modern Studies Working Group, please e-mail Nathan Braccio or Melissa Rohrer at earlymod@uconn.edu. For more information go to www.folger.edu or contact Brendan Kane, Associate Professor of History and UConn/Folger representative (brendan.kane@uconn.edu).